While everyone is waiting for the 14.2 release of our beloved Slackware Linux distribution, those pesky developers keep releasing their own software. So this was the week where KDE Frameworks, Plasma and Applications all had newer versions than I have in my repository. 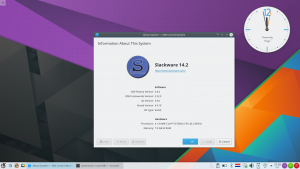 Guess what – I have prepared a new set of Plasma5 packages for the month of May so that I am ready for a new Live ISO… next Slackware release or not. KDE 5_16.05 is my May release of the combined KDE Frameworks 5.22.0, Plasma 5.6.4 and Applications 16.04.1. What’s new in KDE 5_16.05? Plasma 5.6.4 is another bugfix release of the 5.6 series. See https://www.kde.org/announcements/plasma-5.6.4.php . Applications 16.04.1 is also a maintenance release. See https://www.kde.org/announcements/announce-applications-16.04.1.php . I have fixed the ‘sddm-qt5’ package and now SDDM starts (almost) instantaneously again when entering runlevel 4. Some months ago, the “sddm” user account which is used by SDDM was added to Slackware by Patrick, but it was configured with homedirectory which is not useful (“/var/empty” instead of what my package uses, “/var/lib/sddm”). The “sddm” user account writes its status files to its homedirectory. The ‘sddm-qt5’ package’s post-installation script (doinst.sh) will now modify the homedirectory of the “sddm” user if it already exists on the system. Tip: after upgrading, please check the “sddm” account (using “getent passwd sddm” command) and fix the homedirectory manually if for whatever reason, the ‘doinst.sh’ script was not successful in its modification. All in all, a fairly trivial upgrade if you already have my Plasma 5 packages installed. See below for install/upgrade instructions. If you want to give it a trial run, I hope to have a Live ISO available at http://bear.alienbase.nl/mirrors/slackware-live/ soon. Check the timestamp of the “slackware64-live-plasma5-current.iso” ISO. 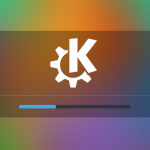 Upgrading to this KDE 5 is not difficult, especially if you already are running KDE 5_16.04. You will have to remove old KDE 4 packages manually. If you do not have KDE 4 installed at all, you will have to install some of Slackware’s own KDE 4 packages manually. Posted: 17 May, 2016 in Slackware, Software. … just uploaded a ki18n-5.22.1 to fix a compilation issue that some peoplehit depending on their libgettext. LOE, the problem with krdc is that xfreerdp is a RUNTIME dependency, but krcd software configuration disables the support when it does not find xfreerdp installed on your computer. So what I did for the next release (or perhaps I will do it as an intermediate update) is “fake” the existence of xfreerdp when compiling krdc. That seems to work. I do not have a Windows machine to test it with but I do have a “RDP” entry in the krdc protocol dropdown now, even without freerdp installed. Thank you Eric!! Everything works smoothly here so far. You can try deleting all that is in there, and then manually edit the baloo configuration file ~/.config/baloofilerc and make sure that the “first run” parameter is set to “true” (incorrectly documented in https://community.kde.org/Baloo/Configuration) so that baloo will start the index process from scratch again. Note that in the Plasma5 Live ISO I have disabled baloo filesearch and you have to enable it manually in “System Settings > Search”. I can report an issue now. When I first booted this new Plasma build I was at office, where I use a monitor attached as my laptop, working as a secondary display. Upon booting this new Plasma, my panel now appeared at the *secondary* monitor instead of appearing at my laptop (primary) display as usual. All this, with no change in the KScreen configuration; my laptop display is still listed as primary. No big deal, I thought. But today I’m working from home. Upon booting in Plasma without any secondary displays and suddenly I was left with no visible panel. I added another panel, and from the widget selector is evident that my original panel is there, but it’s off the screen area and it’s inaccessible. Thank you again for everything Eric! Also, how do I make my custom compose key keystrokes in ~/.XCompose work with GTK apps? What sort of input does Slackware use? XIM? SCIM? Something else? I had to put everything back on a single line to have my “suspend/hibernate” feature working again. Michelino, I had the same issue with missing suspend options for two or three months now and thought that this was a bug in KDE5. Your post gave me some hope, as indeed I have the same rule over two lines, however your fix doesn’t work for me. How did you find out about this? I’ve modified mine according to it and rebooted my pm. Michelino, thanks a lot! I grepped in /var/log for “kit” and found that policykit failed to load the “10-enable-suspend.rules” file. Looking into that, I just realized that for some reason it was in 660 unlike other files in the same dir. Setting it to 644 and reboot brought me back my suspend/hibernate buttons. A good additional tool, partitionmanager was ported on kf5, and work fine here, Eric. Thanks guys for finding the cause of the missing ‘suspend’ in the menu. I will upload a fixed powerdevil package shortly, where this rules file has “644” permissions. Anyone else having an issue with the locale and UTF-8? It used to work and I can’t figure out what happened. My locale setting when I first login. @aocab I do have issues with Locale. I have tried changing the keyboard layout to UK via System Settings>Input devices and it still types as US. If I switch to a non-X terminal the keyboard layout is UK as I expect. I tried recreating both the .kde and .config directories as well as .local but haven\’t had any success. Thanks again for a job well-done. I am only picking up one issue though; when I launch ktorrent from the launcher I get “KDE.Init could not lauch /usr/bin/ktorrent”. weird thing though, when I launch it from konsole is launches. I checked the ktorrent.desktop file and made recommended changes as found online, but still I get the same error. Can you advise on this please. lasieab – ktorrent works fine here, started from the menu, using krunner or started from a console. Please check if you have installed the latest versions: ktorrent-5.0.1 and libktorrent-2.0.1. okular(5543)/okular (app) Okular::DocumentPrivate::loadGeneratorLibrary: Invalid plugin factory for “okularGenerator_kimgio”! brianlemin, your issue is not with gwenview or with okular. Some other library which is loaded by those programs is trying to link to libgcrypt.so.11. The library “libgcrypt.so.11” is part of Slackware 14.1 so it looks as if you have installed my Plasma 5 packages on Slackware 14.1… which is not going to work. Or else you have another package which was compiled on Slackware 14.1 and which should have been recompiled for Slackware-current. brianlemin, both gwenview and okular work flawlessly here on my desktop. And they also work on a Slackware Live ISO (Plasma5 variant). So I can rule out anything which is part of Slackware or my own ‘ktown’ repository. I’m merging some install instruction in this blog page and in README from repository and some other to update the specific notes in slakpkg+. also may be useful an slackpkg clean-system in upgrades to remove packages no more existant nor in slackware and ktown ( for example xembed-sni-proxy that you wrote in this blog page ). I think that the problem with implementing “slackpkg clean-system” for 3rd party repositories is that Slackware itself will be in the way. Take “libnm-qt”: it must be removed if you install Plasma 5. When you run “slackpkg clean-system” then libnm-qt will not be removed because it is still in Slackware. Anyone know what ports need to be opened in firewalls for this? I notice discovery doesn t really work while my current iptables rules are up. @alienbob: “slackpkg clean-system” is not for remove libnm-qt; it does not replace “slackpkg remove …” to remove slackware packages at install time, but when you upgrade plasma from 5_15.10 to 5_16.05 you should remove xembed-sni-proxy manually, or with slackpkg clean-system that, since xembed-sni-proxy no more exists in any other repository, remove it. Before, i\’m sorry if my question is out of the topic and tickle. But i want reset dropbox icon in systray, how to reset or change default dropbox icon not using breeze icons?? I was moved /usr/share/icons/breeze/status/16/cloudstatus.svg and dropboxstatus-* and the result dropbox icon is ugly and become big. Arief, I do not think that a custom dropbox icon can be selected. The dropbox daemon uses its own icons as far as I could see. Yes me too, as well as Applications 16.04.2 but I wait with releasing all of it until after the next Plasma is also released (next week). baloo has sysconfdir in /etc, maybe it’s better it have sysconfdir in /etc/kde. Installed Slackware 14.2. Runs well, but… After a day or three, sometimes sooner, attempts to launch anything yeild KDEinit: could not launch error messages. Not even systems applications launch. Have to bring X down and restart everything. Tried the “X-DBUS-StartupType=none” to /usr/share/applications/kde4/konsole.desktop “solution”, but that does not help. Also, can not get NFS working, it keeps giving access denied by server messages. She is my sys, and I admin her… but I’m not a sysadmin, just an applications programmer. John , I do not understand why you are posting this story about your Slackware 14.2 troubles as a comment to a year-old article on Plasma 5? It would only make sense to post your in the LinuxQuestions forum, which is where Slackware related issues can be brought to attention. This blog of mine is mostly to discuss issues with *my* packages and scripts.